I'd like some clarification on the way Proficiencies and Emphasis apply when one is using two weapons that fall under multiple Proficiencies and single weapons that can be used with multiple Proficiencies. Example 1: Someone has the Messer proficiency at 8. He can use any messer-like blade and any daggers and bucklers associated with messers. So, let's say he fights with a messer and a dagger. If his messer gets disarmed he continues to fight with his dagger using the messer proficiency? If he also has Dagger 5 (def4+1). If he gets Reach Control does his Dagger emphasis (+4CP instead of +2CP) comes into play? When only wielding the dagger his proficiency adds +8 or +6? Can he use both Emphasis benefits at that time? Or his proficiency CP contribution fluctuates? Example 2: Another someone fights a lucerne hammer. He has Mass Weapons 10 and Polearms 6 (def5+1). His CP is calculated by the proficiency he opts to use, or it is his highest of 10? Do both Emphasis come into play? For example can he use Hook/Trip at AC0 on the 1st tempo, then on the 2nd tempo hit with a Power Swing at AC2 for +2DR? And if yes, what was his CP from proficiency for that Phrase? Benedict wrote: If his messer gets disarmed he continues to fight with his dagger using the messer proficiency? If he has no applicable weapon for the main proficiency, he needs to switch proficiencies at the next refresh. Benedict wrote: If he also has Dagger 5 (def4+1). If he gets Reach Control does his Dagger emphasis (+4CP instead of +2CP) comes into play? Before messer is disarmed? Nope. After messer is disarmed? Immediately after, in the 2nd tempo? Nope. Still using Messer proficiency, but loses access emphasis, as he lost the main weapon. If he switches to Dagger proficiency at next refresh? Yes. But he could also switch to, say, Brawl to benefit from those emphases and keep dagger for the "punch". Benedict wrote: Example 2: Another someone fights a lucerne hammer. He has Mass Weapons 10 and Polearms 6 (def5+1). If a weapon is applicable to multiple proficiencies, you pick the one that you want to use, including the emphasis. You can't get multiples. If you want to change the proficiency, you can do that during refresh. Lucerne hammer is basically a pollax with four prongs in the front instead of an axe blade and usually a slightly longer beak, so, you could go with either proficiency here, depending on what you need to accomplish. To put it simply, at each Refresh you calculate CP with Ag+Cu+Prof, according to the proficiency you are using. And for the whole Phrase the only Emphasis that applies is from the Proficiency used. You can switch between Proficiencies only at Refresh, not between Tempos. Ok, I understand all these, and kinda thought it works that way. What I still have issues with is CP calculation at refreshes when multiple Proficiencies are concerned. I'll insert an example. There's a guy armed with a longsword with Ag4, Cu4, Longsword10, and Brawl5 (def). On the first tempo he has initiative and attacks an unarmed foe. He uses 4 dice for swing and his opponent grabs his weapon and succeeds at MoS1, putting them in a grapple. On the 2nd tempo the swordsman has 14 dice left, correct? With those 14 dice he could Break, Resist, or Reverse, correct? Let's say he successfully Resists. On the next refresh he is forced to 13CP (Ag+Cu+Brawl) since he is in a grapple, or he can attack with pommel strikes at 18CP (Ag+Cu+Longsword)? On page 54 they say that all grappling uses some version of Brawling, so my guess is you're forced to switch to Brawling at Refresh. Korbel wrote: On page 54 they say that all grappling uses some version of Brawling, so my guess is you're forced to switch to Brawling at Refresh. Read the whole paragraph, not just a line. The text is not explicitly clear, if not contradictory. with firearms, but no weapon can be thrown. basic maneuvers for all purposes. Finally, favoring (see chapter 10) is impossible in a grapple. According to the text you could use any Hand and Close Reach weapon (Close reach weapons work normally). Doesn't state which Proficiency should be used though. A guy with Dagger 10 Brawl 5 (def) is weaker than a guy with Brawl 7 during a grapple when he has a Bowie knife at hand? The armed guy uses Dagger 10 or Brawl 5? 2 or 3 dice in CP is a big difference. On the previous example with the guy armed with a longsword. 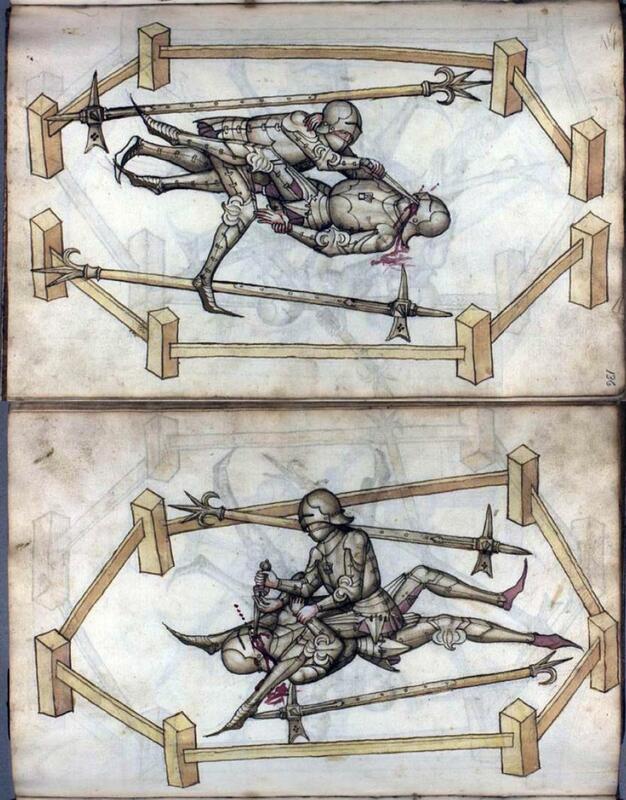 Longswords are two-handed (Weapons that require two hands cannot be employed at all), but specifically longswords (and estocs) of all the two-handed swords are Agile ( Can be used one-handed at -1DR. For obvious reasons, this is for categories of weapons that are normally two-handed.) The example I used was very clear, timing and sequence are very important. Should the guy with the longsword had lost the 2nd tempo he wouldn't be able to use the sword because all grappling attacks are restraining. But since he beat his opponent during 2nd tempo with a Resist he is not restrained, if not mistaken. On the next Phrase he can use that sword pommel to smack his opponent in the face? Which proficiency comes into play? Brawl 5 or Longsword 10? 5 dice is huge. Even if he were to draw and attack with his dagger it is still Brawling until he can successfully Break away. It says clearly "All grappling uses some version of the Brawling proficiency". At the start of the phrase, pick a proficiency of your choice that could make sense for whatever weapons you are holding. If your in a grapple, its always Brawling. Then determine CP, using proficiency, range and other modifiers etc. For the entire phrase your CP is unchangeable (except for impact); no matter what happens to your weapons or how reach, grappling or being disarmed etc changes. Your emphasis is also locked in stone for the phrase. If you chose Spears proficiency and got your spear disarmed you wouldn't lose the Reach Control expertise. Maneuvers on the other hand, check what makes sense at the time of selection. If your shield is disarmed in tempo 1, you can't use shield bash in tempo 2 even though you will still be using your full Sword & Shield CP. You can be in situations like starting the phrase with Sabers proficiency, being disarmed and drawing a dagger to use Hook in Tempo 2 (Hook is usually not available to Sabers). Similarly the first phrase of grappling is usually going to be using your highest proficiency, and not your Brawling value. thirtythr33 wrote: It says clearly "All grappling uses some version of the Brawling proficiency". basic maneuvers for all purposes." When I want to grapple someone I use Brawling. Imo "All grappling uses some version of Brawling" should read "All grappling maneuvers use some version of Brawling". One paragraph above it clearly says that "All weapons are limited to Swing, and Thrust maneuvers only, along with their respective augmentations." There's nowhere that it says that "these maneuvers are handled with the Brawl Proficiency." Imo that needs clarification. If what you say is correct, during a grapple, if I have Brawl (grapple) 7 and Dagger 3 (default) I could use any of the grappling maneuvers at +7CP. If I also had a knife at hand I'd also attack with the knife at +7CP. If I had Daggers 10 and Brawl 5 (default) when attacking with that knife during a grapple I'd get +5CP. Benedict wrote: If what you say is correct, during a grapple, if I have Brawl (grapple) 7 and Dagger 3 (default) I could use any of the grappling maneuvers at +7CP. If I also had a knife at hand I'd also attack with the knife at +7CP. If I had Daggers 10 and Brawl 5 (default) when attacking with that knife during a grapple I'd get +5CP. Yes, that is my understanding. If you are a dagger specialist and don't know Brawling, you probably want to stay inside your target's reach and NOT initiate a grapple. "Grappling" is a "condition initiated by a successful Grab maneuver". You are either "Grappling" or you are not and it remains until someone uses a successful Break maneuver. While Grappling you apply all the special rules listed in the section. Those special rules are restrictions on which maneuvers can be used and under what circumstances as well as some rules changes. One rule it changes is "all Grappling uses some version of Brawling proficiency". All this combined means "if someone has successfully used a Grab maneuver, you use some version of Brawling Proficiency, until someone uses a successful Break". This includes Swing, Thrust, Discharge or any other maneuver still available considering the other restrictions of the Grappling condition. thirtythr33 wrote: Yes, that is my understanding. If you are a dagger specialist and don't know Brawling, you probably want to stay inside your target's reach and NOT initiate a grapple. This could lead to an interesting exploitation of the system. I'll elaborate. Someone with priority 5 @ Proficiencies could assign Brawl (grappling) 10, then have all the other weapon proficiencies @ 6 (default 5 + 1) to claim Emphasis for each, and still have 1 more point to assign to Proficiencies. He fights (almost) as priority 3 with every single weapon across the board claiming emphasis for every single one. When he grapples he fights like a grand master. All melee weapons have access both to Grab (off) and Grab (def) maneuvers, enabling him to go down to grappling in a pinch. And should he be using cutting/piercing weapons carve his opponent really bad at +10CP+attributes, way better than a knife master who has Daggers 10+. I'm not convinced that's the way the game is supposed to work. I like this, good ideas. Should be effective in many cases. Personally, I would rule that if are using the Brawling Proficiency, you can't use your weapons length to gain Reach Control. So, let's say your character meets this knife master (Prof 10 Daggers). You both have daggers. If you want to employ your tactic, you pick Brawling Prof at the beginning - automatically giving your opponent Reach Control (+4 dice). Now it's gonna be much harder to Grab him, even if it's free of AC for you, because 4 dice is significant. Korbel wrote: Personally, I would rule that if are using the Brawling Proficiency, you can't use your weapons length to gain Reach Control. Er, better read the reach rule. If both are using the same weapon (messer vs messer, rondel vs rondel), no one starts with Reach Control at Phrase 1.
page 104 wrote: Compare the weapons being used. If both combatants have weapons of equal reach or are locked in a grapple, ignore this step. In the case of a reach mismatch, one of the characters has a benefit over the other in the form of reach control. This translates to +2CP (+4CP if they are benefitting from the emphasis of the Polearms or Daggers proficiency). At the start of the fight, control goes to the character with the longer weapon by default. pretty well always use the Daggers proficiency, but if you’re in a grapple you may find yourself using Brawling for them. It's all in the wording that makes everything controversial. "If you are in a grapple you may find yourself using Brawling..." instead of "If you are in a grapple you will find yourself using Brawling..."
If we go by that sidebar nothing prevents me from using pommel strikes, resists, or breaks with my Longsword proficiency while in a grapple, as I may have to use Brawling. Also nothing prevents me from using the Brawl proficiency while I wield a dagger vs another dagger, throw white, then preempt with a grab without giving reach control. Because I may be using Daggers proficiency, not will be using Daggers proficiency when I face off that guy. All I'm trying to say is that its open to exploitation and various interpretations, nothing more. When a rule isn't clear enough and leaves players and GMs arguing among themselves who is right and who is wrong imo that rule needs a better wording. And here's how the fight really took place. Benedict wrote: Er, better read the reach rule. If both are using the same weapon (messer vs messer, rondel vs rondel), no one starts with Reach Control at Phrase 1. Of course. What I mean is I would house-rule, if this exploitation you presented was ever a problem. And it even makes some sense: if you choose Brawling as your Proficiency, you stress your unarmed attacks - forcing you to come closer (to start a grapple free of AC, and such). Brawling is a unique style (other Profs stress the use of weapons), I think it's fair to give it a unique limitation. But this is only my proposition for the situation you presented (fighter with 10 in Brawling). Korbel wrote: What I mean is I would house-rule, if this exploitation you presented was ever a problem. And it even makes some sense: if you choose Brawling as your Proficiency, you stress your unarmed attacks - forcing you to come closer (to start a grapple free of AC, and such). Brawling is a unique style (other Profs stress the use of weapons), I think it's fair to give it a unique limitation. But this is only my proposition for the situation you presented (fighter with 10 in Brawling). This is still Beta. So better weed out and clarify confusing stuff now, instead of house-ruling later. 33 is again correct. If you're in a clinch, pommeling some boor bugger in the teeth with your longsword, that's Brawling. Whenever you're in grapple, you revert to Brawling at refresh. Benedict wrote: It's all in the wording that makes everything controversial. "If you are in a grapple you may find yourself using Brawling..." instead of "If you are in a grapple you will find yourself using Brawling..."
Well, yes, you may. Tempo 2 after being grappled would be a situation where you're in a grapple and you're NOT using Brawl, as there haven't been a refresh yet. We'll need to look into clarifying the wording though. Benedict wrote: This could lead to an interesting exploitation of the system. I'll elaborate. Someone with priority 5 @ Proficiencies could assign Brawl (grappling) 10, then have all the other weapon proficiencies @ 6 (default 5 + 1) to claim Emphasis for each, and still have 1 more point to assign to Proficiencies. He fights (almost) as priority 3 with every single weapon across the board claiming emphasis for every single one. When he grapples he fights like a grand master. All melee weapons have access both to Grab (off) and Grab (def) maneuvers, enabling him to go down to grappling in a pinch. Aaand... where's the exploitation part? Grappling is fundamental to most western martial arts. That would be an extremely practical path to versatility. Benedict wrote: And should he be using cutting/piercing weapons carve his opponent really bad at +10CP+attributes, way better than a knife master who has Daggers 10+. You mean that knife master will lose his emphasis when both are holding knives? If you think that knife master has no edge in this fight, you're forgetting that he might have some throwing knives up his sleeve. Also, you imply that he has a larger dice pool, so, he's likely to have better chance at pre-empting. And our grappling hero still needs to pay AC2 for any Grab attempts. But it is true that this would be an evenly matched (and extremely ugly) fight in real life as well. higgins wrote: Well, yes, you may. Tempo 2 after being grappled would be a situation where you're in a grapple and you're NOT using Brawl, as there haven't been a refresh yet. We'll need to look into clarifying the wording though. Exactly. I believe that this should be included in the "Establish Dice Pools" part of Chapter 10. Grappling is fundamental to every single melee martial art that I'm aware of, armed or unarmed. Do note, I said martial art, not martial sport, there's a huge difference. A game is one thing, real life is another. There's no possible way to 100% accurately model real life combat with dice (or cards, or whatever). The best bet is making a rock-paper-scizors model. When there's a universal skeleton key (ie all melee combat usually breaks down to grappling, or katana are the best swords ever crafted, etc) in the system it can become repeatedly and boring. Also that's an open invitation to min/maxers and powerplayers to kill the game. Yes, he can invest heavily and throw with full CP. And the grappler (who as I said threw white) dodges at full CP. Not really viable. Unless the daggerman carries a lot of daggers and is moving away from his opponent at the same time to keep his distance.